In November, two U of T alumni became part of the legal world’s most esteemed community: Andromache Karakatsanis and Michael Moldaver were named judges of the Supreme Court of Canada in a ceremony in Ottawa. Karakatsanis (BA 1978 VIC) started out in a private practice that focused on criminal and civil litigation, but she is primarily known for her work in civil service. She was the first woman to head the Liquor Licence Board of Ontario. She also served as Deputy Attorney General, and was the most senior public servant in Ontario (Secretary of the Cabinet). Prior to her newest role, Karakatsanis was a judge of the Court of Appeal for Ontario. 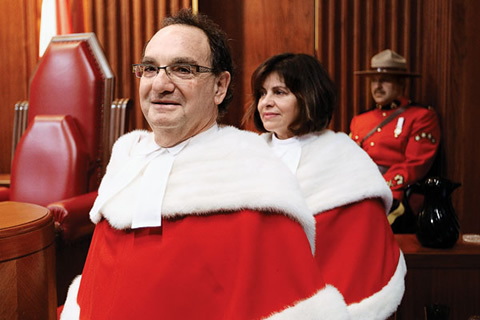 She is the first Greek-Canadian serving on the Supreme Court. Moldaver (BA 1968 UC, LLB 1971) specialized in criminal law during his many years of practice. He was one of the youngest judges to serve on the Supreme Court of Ontario (he was appointed in 1990 at age 42), and, prior to his latest appointment, was a judge of the Court of Appeal for Ontario. He has worked on many high-profile cases: in 2007, he helped acquit Steven Truscott of murder after he served almost 50 years in jail. In 2004, he helped set aside the murder conviction for Robert Baltovitch. At the Faculty of Law, Moldaver co-taught criminal law courses from 1978 until 1995.